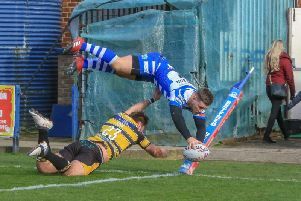 Siddal booked their place in the National Conference Premier Division Grand Final at the first time of asking, easing past West Hull 22-6 at Chevinedge. Gareth Greenwood’s side, who finished six points clear of the second-placed Humberside outfit to win the league leaders’ prize, were never behind in a contest that was probably more one-sided than the scoreline suggests. The teams were locked 6-6 at the break, centre Callum King throwing Wests a lifeline with a try just before half time, but Siddal powered clear in the second period with tries from Shaun Garrod, Zack McComb and Gareth Blackburn. “We’ve got the first part of the job done,” said Greenwood, whose side now have a week off before the decider at Widnes on Sunday, October 30, the venue where they led Leigh Miners so convincingly in 2015 before seeing the prize slip agonisingly from their grasp. “I thought we were pretty dominant today, I expected it to be a closer game. “It’s not a massive scoreline, but for a semi final I thought it was a dominant performance. “We gave them a bit too much ball coming up to half time and you can’t defend for ever and they ended up crashing over. “But there were no arguments today; we’re not the most fluent of attacking teams at times, but I thought we were better than them in everything that we did. “The players in the middle were all good; they’re hard to stop when they play like that; all running hard with lots of talk. Siddal had taken a ninth-minute lead when back rower Tom Garrett, a handful for the visiting defence all afternoon, burst through the line to cross on the right, winger Gareth Stead adding the conversion for a 6-0 lead. Young half back Kyle Akroyd’s kicking game created another chance soon after, with only a freakish bounce on the line denying Siddal a second score. The contest remained instense, if a little scrappy, as the half wore on, with Wests never really looking like puncturing a steely defence. In the final 10 minutes of the half though, Siddal became a bit too careless, giving their visitors a glut of possession that finally, inevitably, told when King plunged over and Luke Foster levelled the scores with the conversion. That stalemate was ended only four minutes into the second half as Siddal stormed out of the blocks and stand off Garrod produced a trademark show and go down the left before bundling his way over near the flag. Stead added the extras and with Siddal finding more and more space in attack, Garrod and winger Gareth Blackburn set up Zak McComb for their third try with 25 minutes remaining, Stead again on target for an 18-6 lead. With the game petering out as a contest, Siddal finally wrapped things up on the scoreboard inside the final quarter, Garrod again the architect as Blackburn flew over in the corner, Stead’s first miss of the game proving academic.